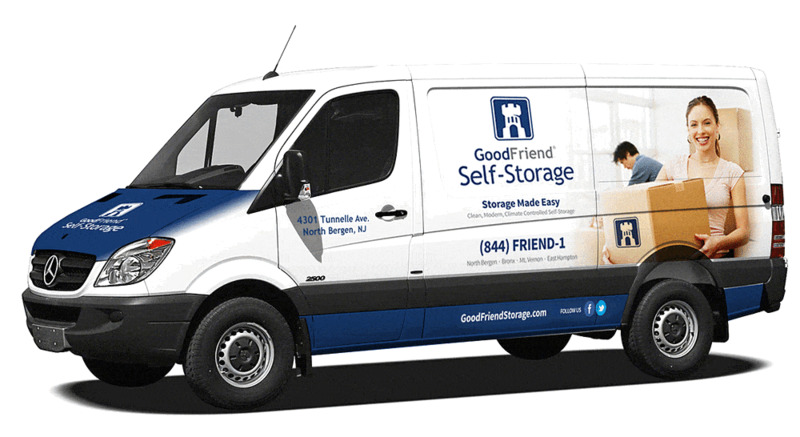 GoodFriend Self Storage offers two different moving van options for qualifying new customers. Each option allows you to save time and money on your next move. Whether you are moving across town, storing business inventory or just clearing all the clutter, GoodFriend Self Storage can help. Upon signing a rental agreement one of our self storage specialists will schedule a day and time for your move. A friendly and experienced GoodFriend Self Storage driver will then arrive outside your home where a two-hour window is granted for you to load and off-load your belongings. Please note GoodFriend Self Storage is not a moving company and our driver does not help with your move. Additional fees and service charges beyond two hours apply. Tenants are responsible for getting to and from the facility on their own. Some restrictions apply. Upon signing a rental agreement our staff will schedule a day and time for your move. You will have up to two hours of free use of our van to load and unload your belongings. After two hours additional fees and service charges apply. Please note we are not a moving company and do not help with your move. Some restrictions apply. For more information about our free moving van and truck & driver options please speak with one of our friendly and courteous staff members and they will be happy to assist you.